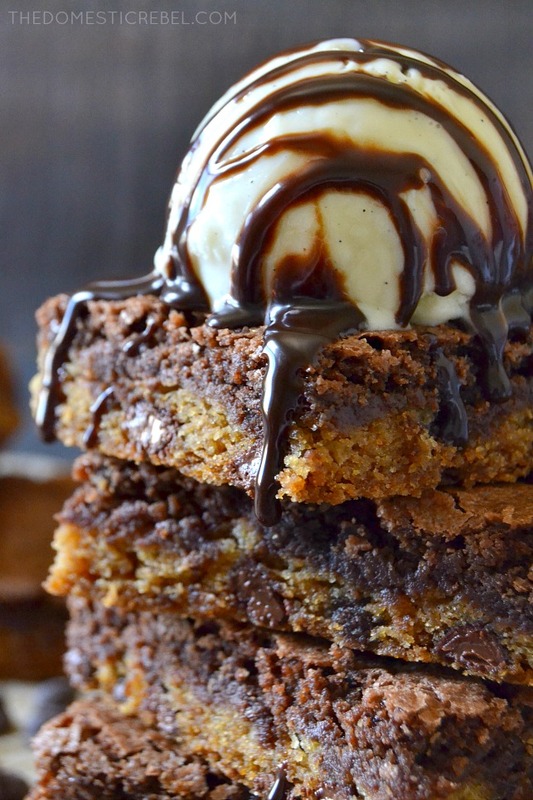 Everyone loves brownies and cookies, but why not have both in one Super Easy Brookie?! 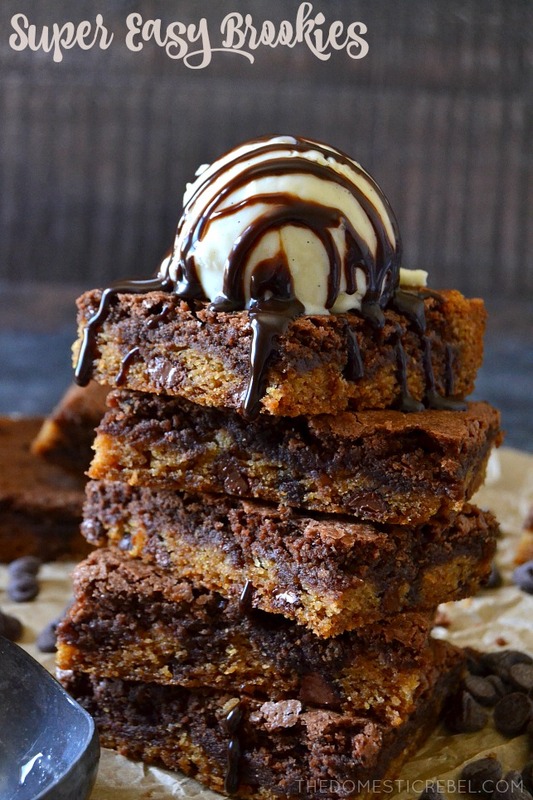 With a chewy, buttery chocolate chip cookie on the bottom and a fudgy brownie on top, it’s the best of both worlds in one unique bar! I can’t believe I don’t really have brookie recipes on my blog! Once I realized this unfortunate news, I knew I had to fix it ASAP… because brookies are life. I mean, I’m the most indecisive person ever. If I had a superpower, it would be Indecision Girl, where I’d stand around for hours trying to weigh the pros and cons of each and every thing until I passed out from the pressure of it all. Thankfully I am not a superhero because that would be the #1 worst superpower ever. These are your classic brookies without any additional bells and whistles… but when you’re dealing with a double-decker bar with a cookie bottom and brownie top, you don’t really need any additional accouterments, ya know? They’re pretty perfect on their own! However, I know people do enjoy Slutty Brownies which is the same but has a layer of Oreos in between the brownie and cookie layers. 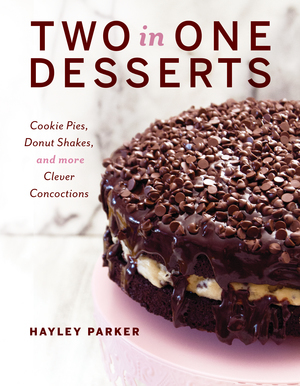 It’s definitely delicious, but I recommend starting with the basics first and working your way up the outrageous dessert ladder slowly. Or don’t, because I don’t rule your life! 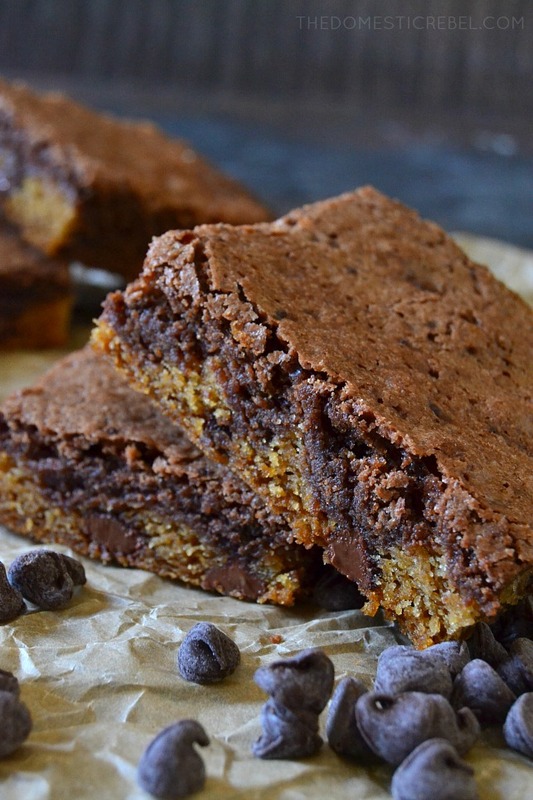 I love these bars because they’re chewy and fudgy as a brookie should be. Some brookie recipes are cakey almost, which is good but not the greatest, IMO. I like my brownies to be supremely fudgy with a great, chewy texture, and these provide that. Instead of chocolate chips in the cookie layer, use peanut butter, butterscotch, or white chocolate chips. Or you could do mint chips for Christmas, or add in colored miniature M&M’s! 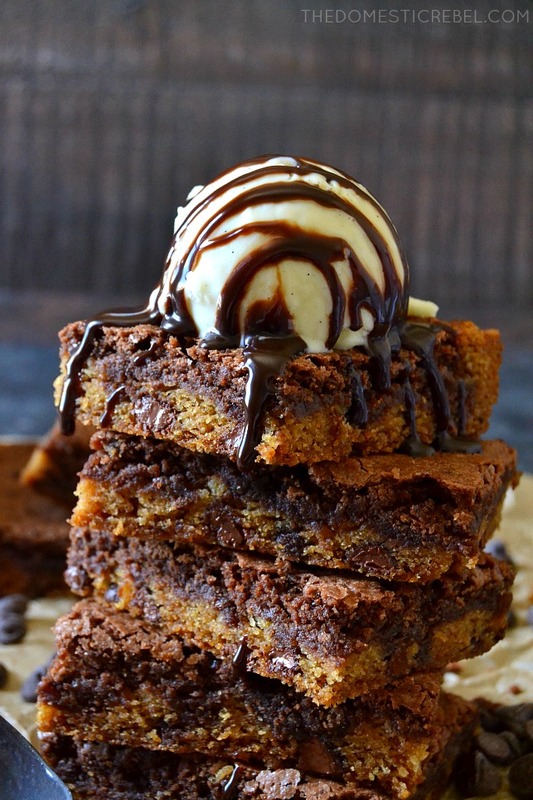 You could swirl peanut butter on top of the brownie layer for a little sweet & salty twist. 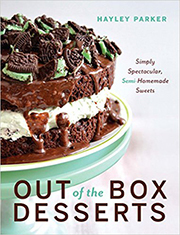 Add Oreos in between the brownie and cookie layers, and experiment with Oreo flavors, too! These would be awesome with peppermint or pumpkin spice Oreos, or some of their other seasonal flavors. Do like I did and top each square with a big scoop of vanilla ice cream, and drizzle lots of chocolate sauce on top. A delightful cross between fudgy brownies and chewy chocolate chip cookies, these Super Easy Brookies will become a new favorite! Preheat oven to 350 degrees F. Line a 13x9" rectangular baking pan with foil, extending the sides of the foil over the edges of the pan. Spray the foil liberally with cooking spray; set aside briefly. For the cookie: beat together the butter, sugars, and vanilla in a medium bowl with an electric mixer, beating until creamy. Add in the egg and beat until fluffy, about 1 minute. Add in the dry ingredients and beat on low speed until a dough comes together. Stir in the chocolate chips, then spread the cookie layer evenly into the bottom of the pan. Set aside. For the brownie: Stir together the melted butter, sugar, and vanilla together in a medium bowl until blended. Add in the eggs and mix well. Stir in the dry ingredients until batter just comes together. Pour the batter evenly over the cookie layer. Bake for approximately 20-30 minutes or until a toothpick inserted near the center comes out clean or with moist crumbs. 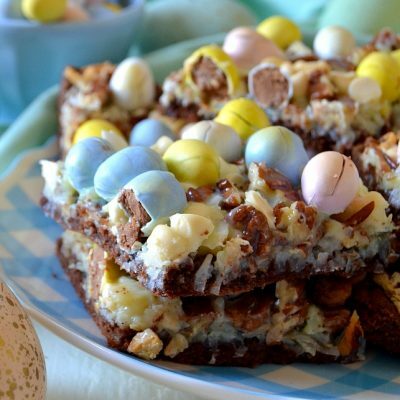 Do not over-bake these as it will lead to dry, crumbly bars. You want them to be slightly underdone as they'll continue to cook as they cool down. Fudgy, chewy, gooey goodness! Everyone will go crazy for these bad boys.